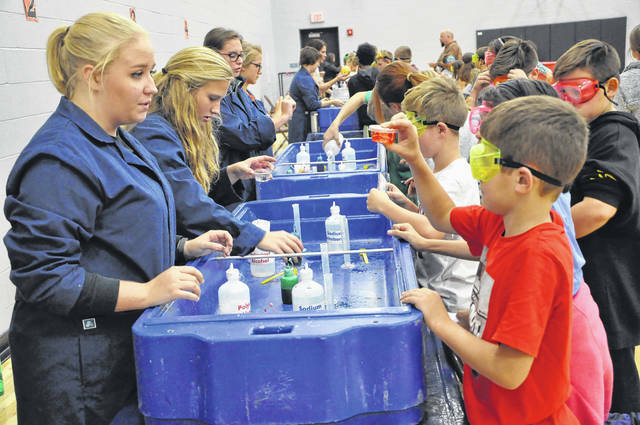 Woodward Elementary School fifth grader Steven Allsup, right, shows his slime mix to Lauren Rehm, a senior from the National Honor Society at Hayes High School, during COSI’s chemistry day Thursday afternoon. There were numerous stations with different chemistry experiments. At the slime station, students could mix chemicals and pick the color slime they wanted before shaking the solution to thoroughly mix the chemicals, and then let it settle. Rehm told students it would take a while for the slime to settle and said they could get the slime back at the end of the day.